Life with Lucy, David and Vivian: Mommy had a meeting . . . So this was how Daddy kept me entertained while she was gone. He did such a good job, I was fast asleep when Mommy got home! Did Marc let her play with trash? BTW - I do remember the zit you had when you went out with Tim Mendenhall. 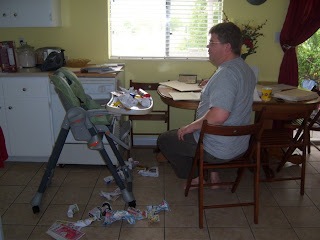 Resourceful dads are the best! Let me clarify that the house did not look like that when Marc got home from work and I had been watching Lucy. I didn't even spill milk all over the kitchen or have a towel incident in the bathroom. I'm making progress.